Women around the world are less likely than men to tap the crowd online for money to fund their businesses and projects, but when they do they are likely to be more successful than their male counterparts, according to a new study. 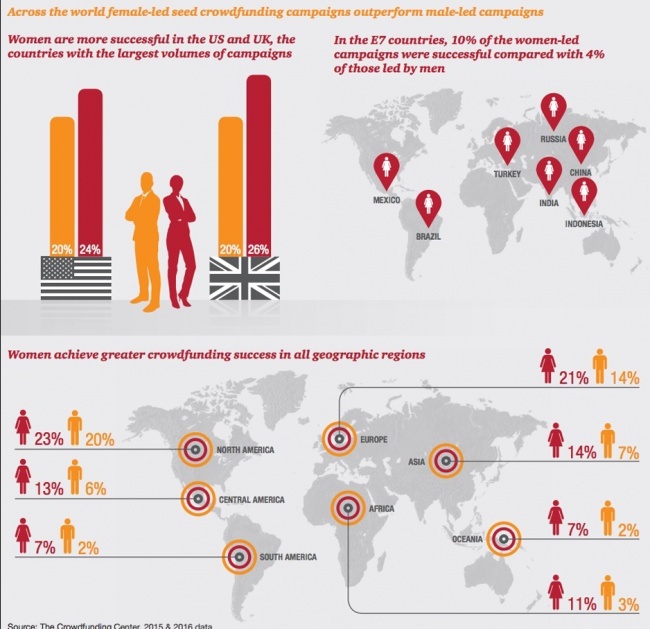 Consultancy firm PwC, together with The Crowdfunding Center, analyzed 450,000 crowdfunding campaigns across the globe over the past two years and found that those led by women were 32 percent more successful at reaching their target than those carried out by men. The results of the study, which were published on Thursday, also found that female-led projects are able to attract an average $87 pledge per funder, while men received $83 on average. The results are in contrast to more established and off-line funding mechanisms for startups such as venture capital, where women have been traditionally underserved, PwC said in the report. Crowdfunding is a growing area of fintech where digital platforms allow individuals or businesses to collect money online to fund their activities, typically in exchange for a product, service or for a stake in the company or as a loan. Crowdfunding and peer-to-peer lending startups include Kickstarter, Indiegogo, LendingClub and Seedrs. The report suggests that the main reason why women tend to be better than men at crowdfunding is that the model itself attracts more women as backers than traditional venture capital. Just seven percent of partners of the top 100 venture firms globally are women, according to the study.